More teeth! Poor Max has been teething again, and he has a new tooth cut through, and one just below the surface. Poor little guy, hopefully it's almost over for those two teeth. The one to the left of his front bottom teeth has dime through, but the right is just pushing through the surface. Soon!! 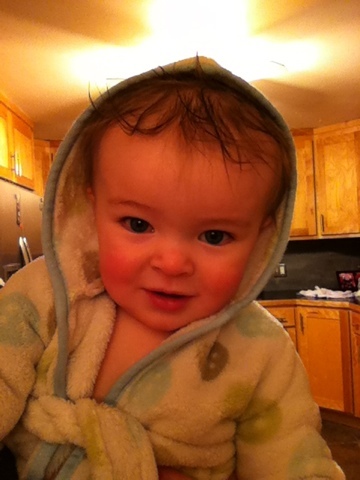 Our smart little boy is all about eskkinh. Max learned a new trick! My mother taught him to make Indian call noises. They were mimicking each other all afternoon Saturday, it was great! I love watching him learn new things. 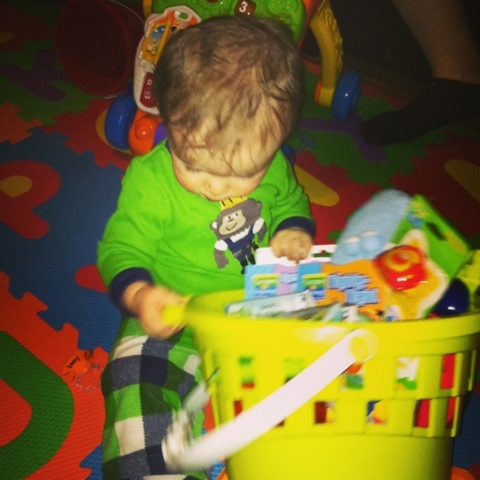 I'm pretty sure he knows how to turn his walker now. 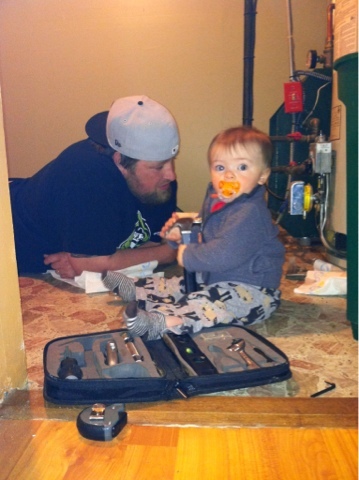 It freaks me out that he can think through the steps to do this already. When he walks into an obstacle (wall, chair, etc.) he sits down and turns his body 90 degrees. Them he pulls the leg of the walker that is furthest from him, which turns the walker 90 degrees. Then he stands up and they take another stroll! It's crazy! I had to watch him a few times to believe that it wasn't just a fluke. 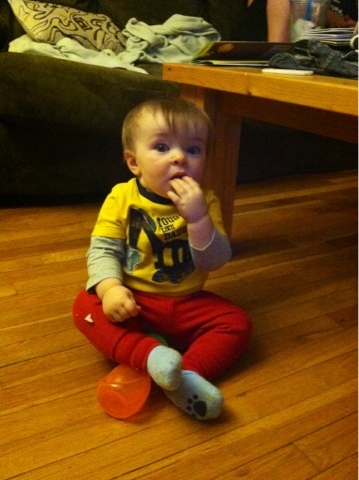 He's really into playing with a plastic red bowl this week. I had put it in a lower cupboard that he likes to open, so that he had an innocent item to pull out and play with. He's taking it everywhere now, and last night he played for fifteen minutes putting it on the rocking chair and having it slide off. He loved it! Crazy kid. His first hair cut was this weekend!! His hair was getting far too long in the back and over his ears, so it needed to happen. He looks adorable (of course), but I can't believe how much older he looks! 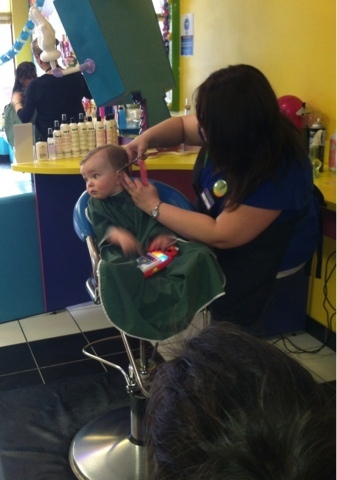 He had a lot of fun and he looked like such a good little boy during his hair cut! 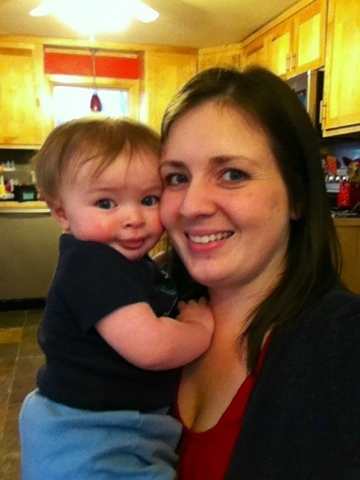 Max is ten whole months old today!! He had his first hair cut yesterday, he looks like such a big boy now! He had a lot of fun getting it done, and he will love all of the girls coming to see it at daycare tomorrow. Breast feeding is still going very well. I'm able to keep up with his demand, plus freeze a little extra. I'm extremely lucky for that, many women aren't so lucky. 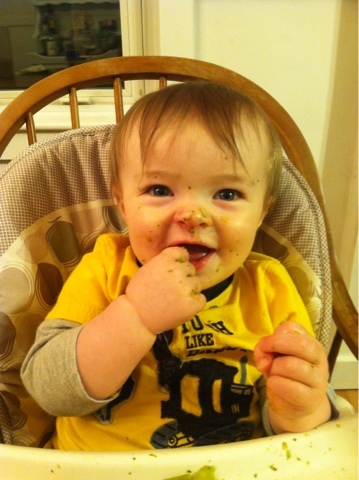 He's doing very well with the solid foods too, and we are trying to incorporate self-feeding at every meal. 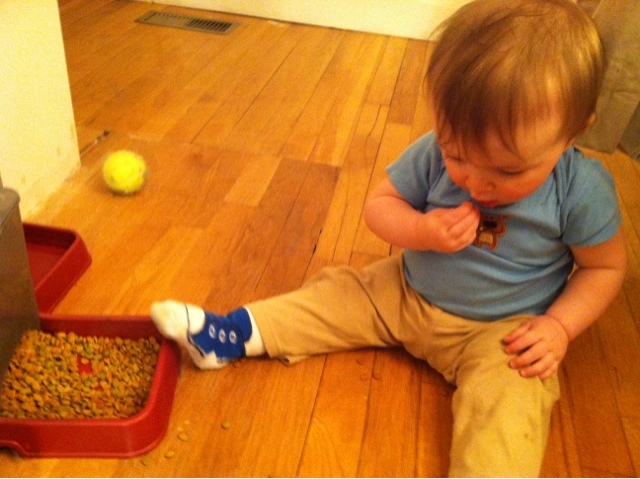 He loves picking up chunks of food and feeding himself. More teeth! Poor Max was teething again this week. His upper teeth are sticking out a little further, and he has some bottom ones coming in. Ouch! Max is determined to get around as quickly as he can. He's constantly walking behind his walker, or pushing things to walk behind. He is getting really good with it, and he's so fun to watch. Proud and happy? Yes to both! His little faces are the best. Unfortunately, there are also plenty of bumps and scrapes too. His forehead is covered in bruises right now. He's tough though! Speaking of his walker... He walks in a straight line with it, it doesn't really turn. So he will eventually (obviously) walk it right into a wall, chair, etc. Monday night he did the most amazing thing. He walked it into a chair and was stopped. He sat down, pulled one corner so that it turned 90 degrees, and then stood back up and kept walking. It was amazing!! I've seen him do this a few times since, and I'm blown away. He's already such a smart little monster. Broccoli is his new favorite food. 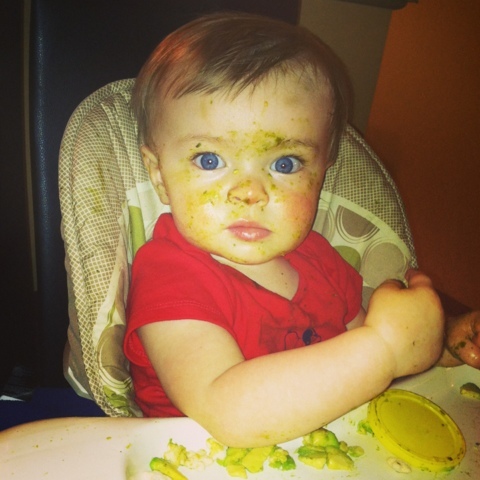 It seems like he has more fun with it than avocado, which I didn't think was possible. He is even getting it stuck on his eyelids! Te new foods are definitely fun. 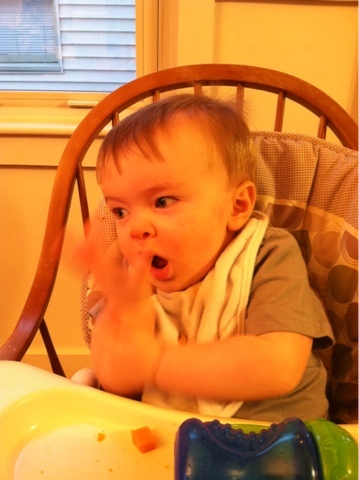 He tried chicken for the first time this week too, but he didn't seem too thrilled. Apparently he's becoming very good at sharing. At daycare he has been bringing toys to the little girls in his class. They're too small to sit up or crawl, so he gives them their toys. Such a sweetie pie! 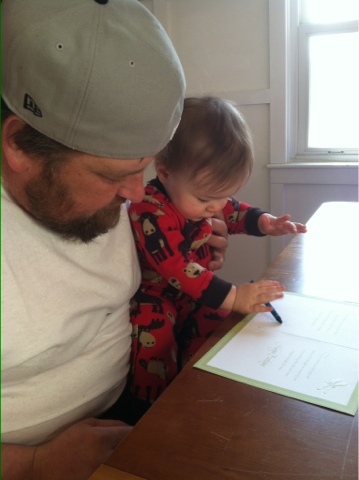 He had a great time helping daddy sign Uncle Tim's birthday card too! He's having a blast banging the crayons around. One bad thing, he finally found the stairs and the cat food. He tried to eat her food, and of course yelled at me when I took it away. 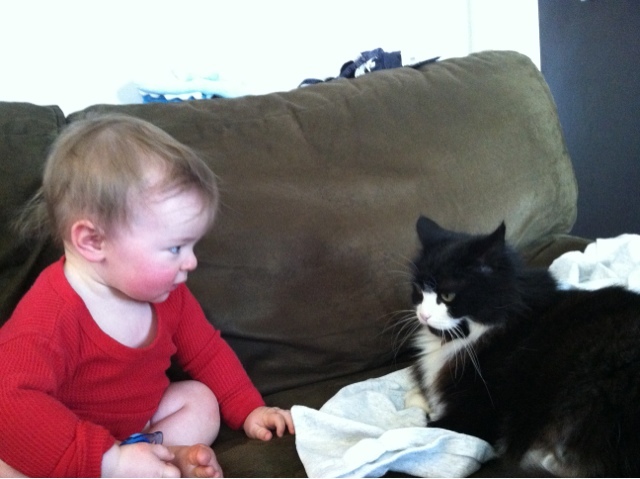 He wasn't interested in boring Cheerios, he was intent on eating cat food! He didn't get up the stairs, but he was sitting at the bottom with this ambitious look on his face. I already know what that face means. Trouble! Time to put up the gates! 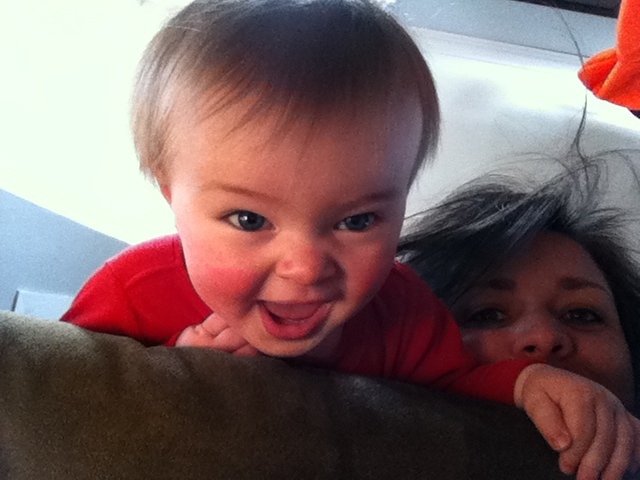 He's saying "mamamama" now!!! He's been using other syllables for a while (da, ba, and ga), but I'm so excited for this one! (Yes, I'm selfish.) I first heard it last night, and all of the hair on the back of my neck stood right up!! It's a crazy feeling of excitement, listening to something that sounds so much like mommy. We say it back to each other, it's fun! Max is a man on a mission with his walker! He just goes and goes, and he is so focused as he walks! It's hilarious! We haven't seen him stand without holding anything yet, at least not fully. 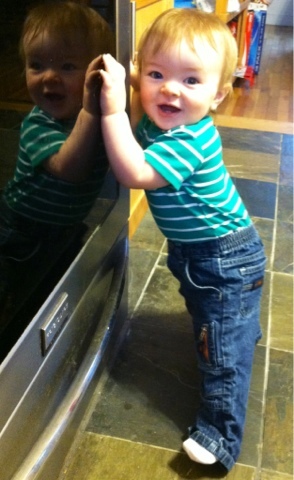 He will let go of things to turn from one to the other, so he's standing on his own for a split second. He's getting more confident every day though. 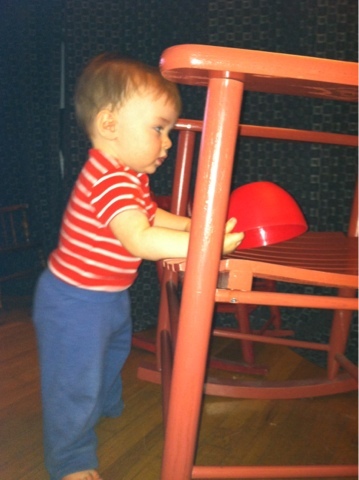 This week he figured out how to hold the cabinet doors open, and get the stuff out inside. He's quite excited about this. Also, pulling the cookie sheets out of the drawer under the oven is a fun time! He's loving the kitchen lately. 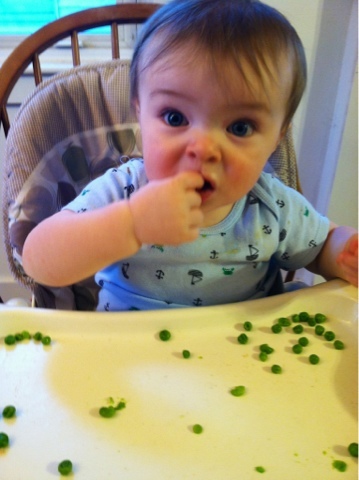 Peas were new this week, and he's loving them. He's feeding himself banana too, so he's feeding himself for two meals when we are picking things like that. 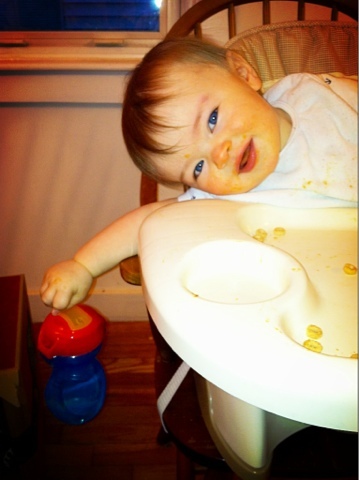 He likes to feed himself, so it makes sense to give him fruit or veggies to feed himself, rather than just Cheerios or puffs. He enjoys meals a lot more when he's picking up his food.